With four dogs living in our home we have a few times that we have pet stains that need to be removed. We love our pets so much but we do not love some of the smells that come with them. This is a great stain and odor remover from Sunny & Honey. You will just simply spray it on the effected area and let sit. You can then come back and clean up the stain. I usually let it set about 10 min or so then come back with a brush and scrub up the stain. The stains usually come out pretty easily and the smell is eliminated. Now this is for carpets, furniture, floors, anything really. (Of course make sure to test it on your furniture before covering a large area with it) but I had not problems at all using it on my fabric furniture. It worked great and removed all the stain and odor easily. #1 PROFESSIONAL’S CHOICE – Sunny & Honey Professional Stain & Odor Eliminator is the #1 Professional’s choice when it comes to cleaning up a mess caused by dogs, cats, and other animals. This product has a unique Bio-Enzymatic formula that is tough on stains and odors caused by urine, feces, vomit, and drool. The Natural Bio-Enzymatic formula gets to the root of the problem quickly and eliminates it completely – not simply masking the smell. The enzymatic bacteria are activated when sprayed upon a stain and odor problem area. The bacteria eat away at the mess and eliminate the stain and odor completely. Once the stain and odor are gone, the bacteria dry up and disintegrate. Leaving nothing but a clean and fresh surface behind! CLEAN IT ALL – The days of buying specific cleaners for carpet, floors, or your automobile are gone! Sunny & Honey Professional Stain & Odor Eliminator cleans it all! This fantastic cleaning solution is great for carpets, rugs, hardwood, tile, cloth and leather furniture, animal bedding, automobiles, rv’s, pet crates, litter boxes, pet travel bags, and many other uses! 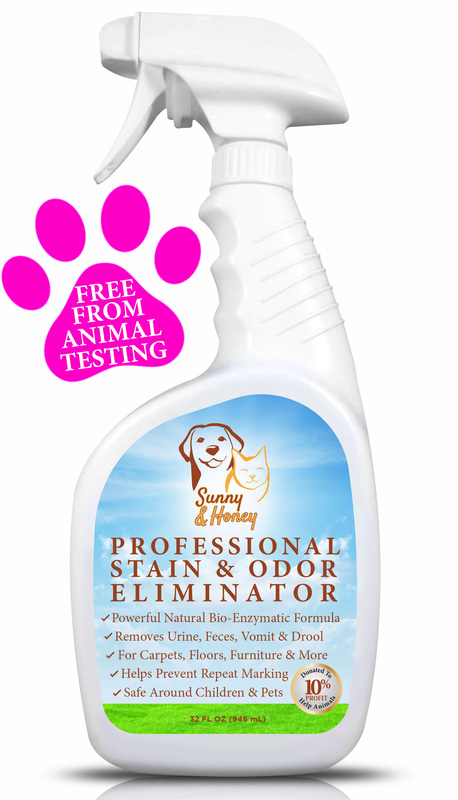 Sunny & Honey Professional Stain & Odor Eliminator cleans up the entire stain, removes the odor, and discourages your pet from marking in the same area again. This cleaning solution has a pleasant fresh peppermint scent. CHILDREN & PET SAFE – We genuinely care about the safety of your children and pets. That is why Sunny & Honey Professional Stain & Odor Eliminator is completely safe to use around your children and pets. The Natural Bio-Enzymatic formula does not contain any harmful chemicals. Therefore, Sunny & Honey is children, pet, and earth friendly. Sunny & Honey Professional Stain & Odor Eliminator is certified by The Carpet and Rug Institute, which also approved the safety of this product around children and pets. We take safety seriously! GUARANTEED HIGHEST QUALITY – Sunny & Honey Professional Stain & Odor Eliminator is manufactured in the United States. We are proud of our manufacturing facility, which uses only the highest quality ingredients available. Sunny & Honey Professional Stain & Odor Eliminator is certified by The Carpet and Rug Institute. The CRI seal of approval means that this product was rigorously tested and it was proven to clean up organic stains and odors in a very effective and efficient manner. The Carpet and Rug Institute states that this product will not damage your investment that you are cleaning. No more worrying if it will ruin your brand new rug or carpet! RISK FREE GUARANTEE – We Guarantee that Sunny & Honey Professional Stain & Odor Eliminator is the best product to clean up a pet mess! It was made with the best ingredients available to conform to our highest standard of quality. It simply does not get any better than this! We are so confident in our products that we offer a 100% 60-Day Money Back Guarantee. If you are not completely satisfied with the way this product works for you – send it back for a full refund. You have everything to gain, and only a pet-made mess to lose! Click – ADD TO CART – Right Now!